An Appetizer does not have to be small canapes or really complicated to taste amazing without spoiling your guests’ appetites. 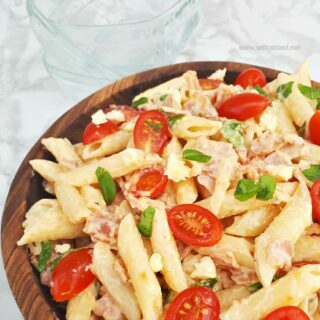 This Bacon Tomato Pasta Salad with Blue Cheese Dressing is just perfect. And it can be served as a light dinner as well ! With the great weather we have in South-Africa we mostly have light dinners, especially during Spring and Summer. Even Fall is quite warm and this salad is always welcome. 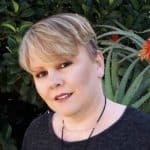 During Winter it is actually the only time our family really digs into comforting, rich foods or a huge home cooked meal. This is now with meat, starch (we even serve potatoes and rice together on the odd occasion! ), as well as at least two vegetables. Great for an Al Fresco addition ! I do however prefer lighter foods as it is usually (not always!) healthier and so much quicker to make. But, then again, warmer weather calls for al fresco-style eating ! Al fresco is eating outside (for us, always) and we normally start somewhere just after lunch time, all gathered around the pool. Obviously mostly over weekends though. It is slow eating, starting with an appetizer, a little later a more substantial meal and of course dessert. This is the type of eating (al fresco) which I think takes a little longer to prepare the courses than when serving a simple light dinner during the week. Whichever way, appetizer or light dinner, you choose to serve this Bacon Tomato Pasta Salad, it will most definitely become a family favorite ! And it all comes down to a great combination of ingredients which already works so well together. 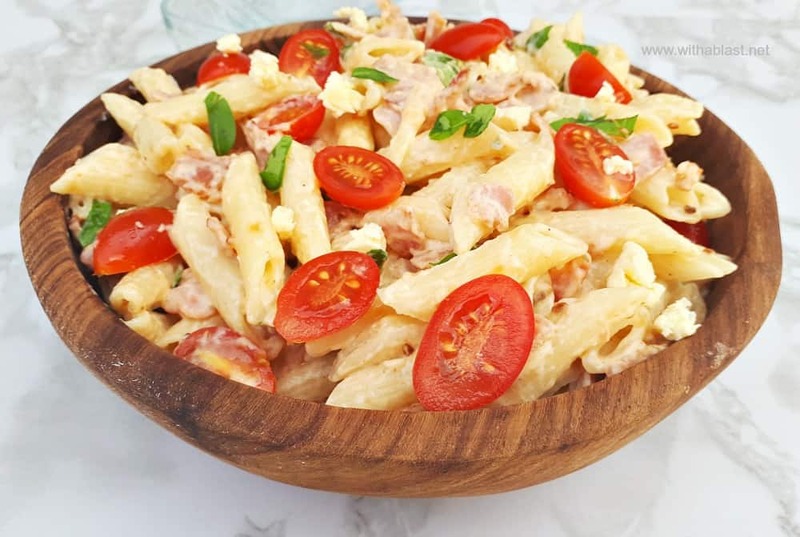 Add the Blue Cheese Dressing and you are in for a taste sensation, which might be unexpected by your guests, but will surely be an awesome surprise to them. 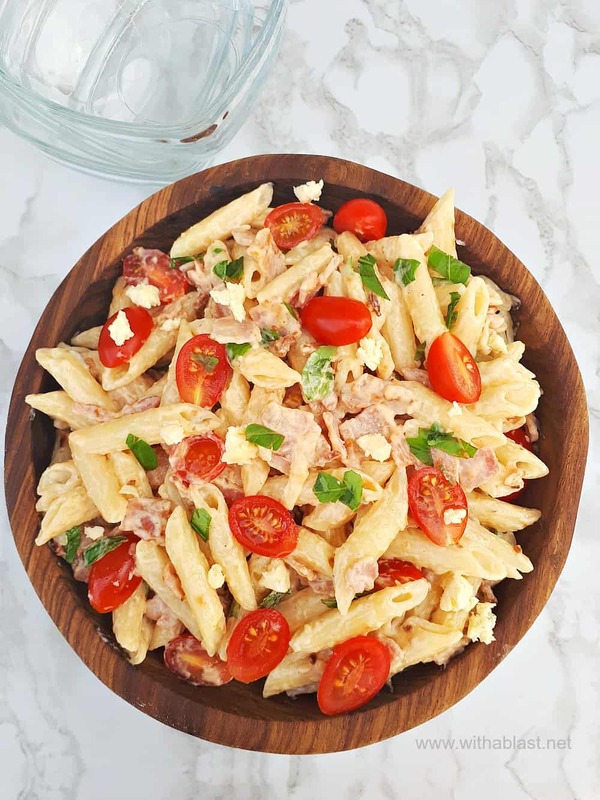 I love a tasty pasta salad for lunch – and this looks incredible! Such delicious ingredients. Great idea for a summer picnic. I’ll be putting this one on the list for an upcoming gathering. I laughed at the rice and potatoes confession. I thought I was the only one who had done that. 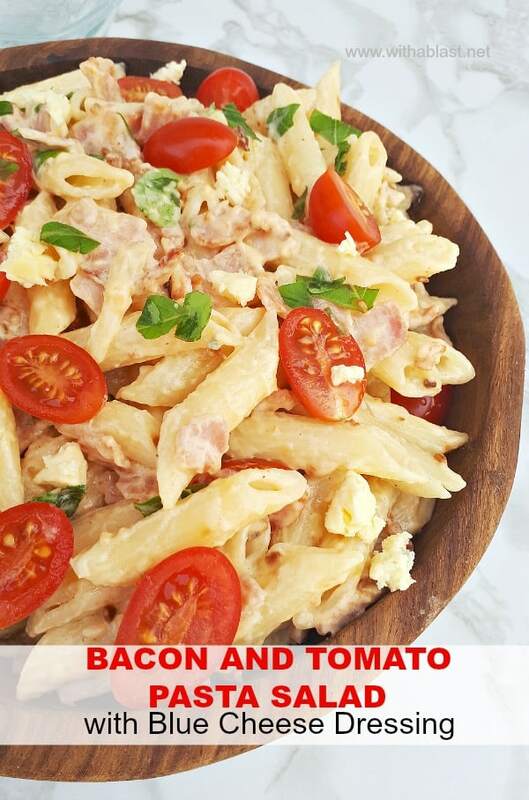 This recipe has the makings of a family favorite for me. Plus, it is so simple to convert to gluten-free! I love the blue cheese crumbles and bacon in this salad! 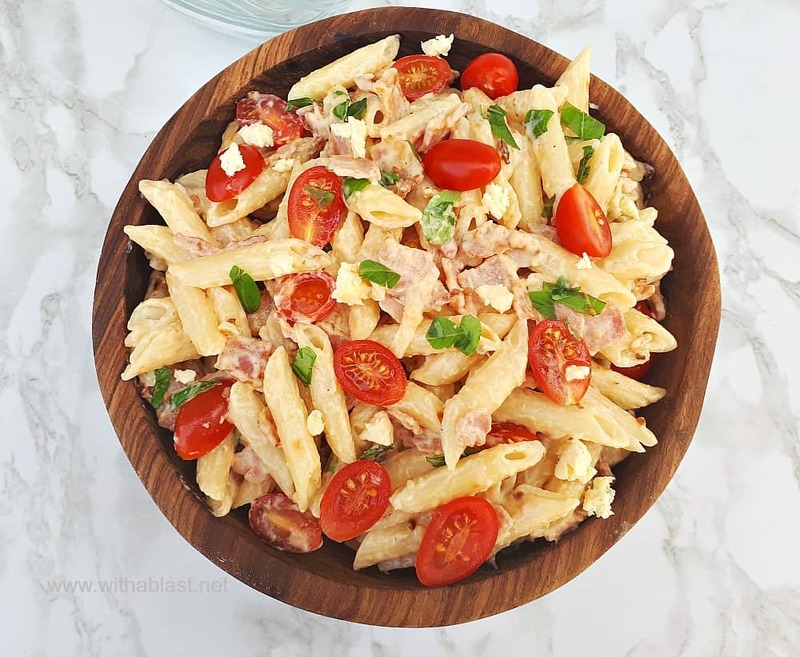 Pasta salads are so great to have for big gatherings also! Love a cold pasta salad in the heat of summer down in here in Texas. I also appreciate how easy and fresh it sounds.